Few people get excited about remotely collaborating with others anymore. Google Hangouts made video conferencing commonplace, and combined with Google Docs' real-time collaboration capabilities, working with a distributed team in real-time is easier than ever before. 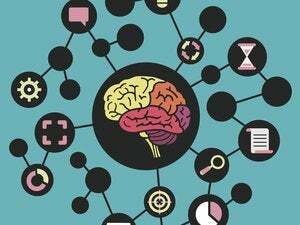 But one form of collaboration doesn't always get the love it deserves: mind mapping. This simple and powerful way to visually represent concepts can help move along any agenda and make complicated topics easier to digest, but isn't included in Google Docs by default. Coggle is a simple and free mind-mapping solution that fills the void, offering real-time collaboration and easy editing. 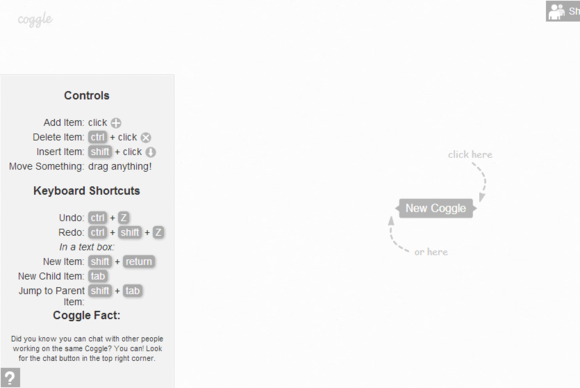 Like MindMup, Coggle is based on HTML5, requiring nothing but a modern browser to work. And like most other mind-mapping software, Coggle starts you off with a single, blank central node. To get started, click the node rename it, then start building your mind map around it. You can drag subnodes around freely, and click connecting lines to change their colors. To keep things simple, Coggle derives the document's name from the central node. Coggle offers a simple help card to help you make your first steps with its bare-bones interface. Coggle goes out of its way to keep things simple. The toolbar consists of just four buttons in the top-right corner, letting you share the mind map, download it as a PNG or PDF (you can't download it in an editable format), view the revision history, and chat with collaborators. All of these are actions that apply to the map as a whole: There are no buttons for interacting with individual nodes. Instead, this is done using hotkeys and interface conventions that require some familiarity. To move a node, just click and drag it. But if you want to move it under a different parent, you have to hold down shift, hover your mouse over the node until an arrow icon appears, and drag the arrow. To delete a node, you have to hold down Ctrl, hover over the node until an X icon appear, and click that. To format text within a node, you can use Markdown, the same text format used by WriteMonkey and Dillinger.io. All of these are things you'll have to discover by reading and playing with the interface—that's the price you pay for a toolbar-free experience. Oh, and there's no way to collapse nodes, at least at this stage. Many features are hidden in plain sight: To change a connector's color, you only need to click it. Coggle's sharing is beautiful and simple. 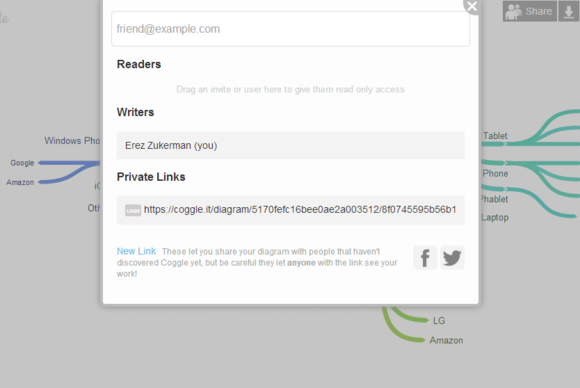 You can invite collaborators using email, or share a mind map as a public link. Viewing a map using a public link doesn't require logging in, but viewers will not be able to edit or change anything. Collaborators you invite over email will be asked to log in using their Google account, and will be able to edit the mind map with you. As they move nodes around or add new content, you will see their changes happening on your screen in real time. This is nice, but can feel disorienting at times because you can't see your collaborators mouse cursors, so there's no visual indication of what's about to happen. Instead, nodes seem to change colors and jump around all over the screen, which can be confusing when working with several collaborators and a large mind map. Sharing your mind map is easy, either publicly (for viewing) or with named collaborators (for editing). Coggle's simple appearance belies considerable depth. It is one of those cases where the lack of a visible UI means you'll have to dig deeper and work harder to figure things out initially. 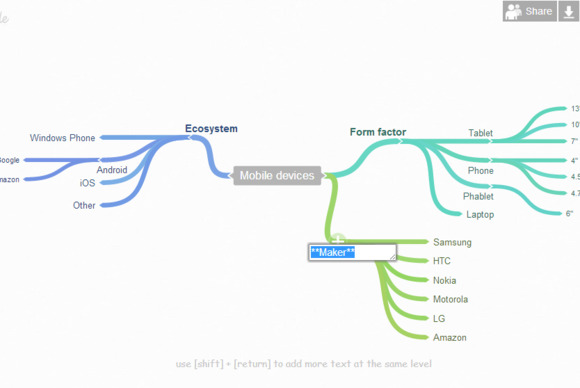 Once you do get the hang of it, it's a pleasant and simple way to create mind maps. If you need real-time collaboration, try it out. Otherwise, MindMup might prove simpler to master. 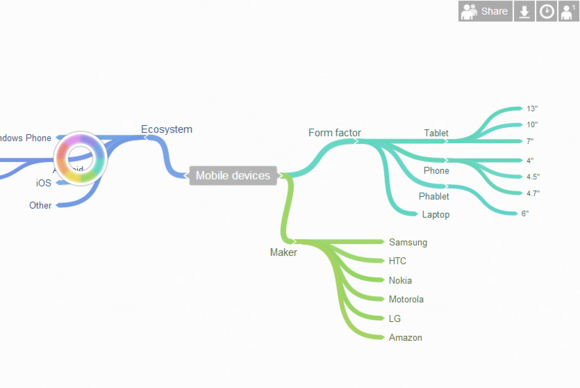 Coggle is almost too minimalistic for comfort, but once you figure it out, it lets you create mind maps in a snap.